"La junularo de Usono ne uzas ŝtuparojn." Translation:America's youth do not use stairs. No. The place no longer exists, as an exercise site, I understand, but it was located in the Los Angeles area. A friend who lives nearby says that it's now a computer store. A computer store.. that makes the escalator a little less inappropriate. Honestly, junularo these days. In my day, we walked fifty flights up a spiral staircase in the freezing cold to get to our classroom! And we walked up both ways! Nah, I rode the banister coming down. as one of the "Junularo de Usono" I detest this fowl slander. Tsk, tsk... Chicken these days are awful at stairs. Mine can't figure out how to go down them. They just rock back and forth, staring, make a tiny hop down one stair, and nearly fall over! These chickens are nothing like good old-fashioned chickens! Seriously, I have stairs in my house... 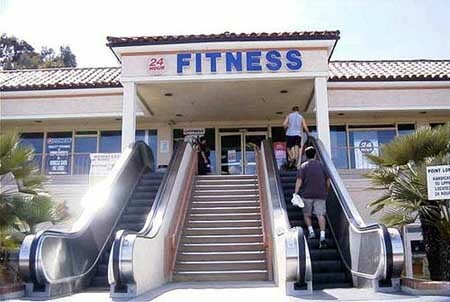 Besides, if there are no stairs available, I still walk up or down the escalator. I misread junularo as ĵurnalo and was momentarily very confused. Never mind the Americans who live in fourth floor walk-ups. As much as it's a pain to move into the top floor, I prefer living here. I don't have to worry about upstairs neighbors stomping their feet and I get a nice cross breeze when I open my windows. So yeah, it's by choice for at least some of us. Hmm, I am struggling a bit with what look like 2 affixes (ul, ar). Would "junuloj" mean the same as "junularo"? If using two affixes, how does one know which to put first? This is a good, solid, and basic question which should be covered in the notes. However I'll explain what I can, and let others correct me as needed. ~UL is a suffix which denotes an individual, a person characterized by the attached quality (belulo= a beautiful person), a class of animal (mamulo = mammal, etc.) or, more rarely, certain inanimate objects. I believe that you can mostly forget that last part. Ulo is a word used to = "guy, fellow person, etc." So junulo is "a young person." ~AR is a suffix which indicates a collection, a group or set of units. It forms "nouns of multitude" and thus can be applied to anything in groups. So a "murder" (flock) of crows = korvaro, a "herd" of horses = ĉevalaro, a group of young people = junularo. As for which goes first? Remember that Esperanto translates from the end of the word to the front, normally. So, continuing to use junularo the ~o indicates a noun, the ~ar indicates a group, the ~ul indicates a person so we already have a "noun group of persons" and the radical, jun~ tells us that these people are young. If we were to reverse ~ul and ~ar (junarulo?) it would become a person who is a young group. A noun representing something that is continuously definitely the opposite of correct (so with error) and disgustingly so. This is really hard... I assume it's not a person but a thing, from the lack of personal affixes. I can't think of an English, single-word answer to this, and I've been puzzling for about ten minutes now, retyping and rephrasing the backwards translation. Something that is habitually incorrect, to an extreme? Am I correct to assume that "ĝusta" means correct as in the right answer, or does it mean morally right? This is extremely hard, and I can't figure it out! I hope you're willing to tell me the answer, even just on my wall, because this is really bugging me! I'm not really getting anywhere with this either! -ad- is frequent, continuous or repeated action. A nasty, wrong substance that continues?? You mentioned this in the context of thinking about where affixes go in relation to each other, so I think there is something about that that I am missing. Vi ambaŭ faris bone kun la ekzerco, kaj donis al mi iom da ridado. Kaj vi ambaŭ havas lingoton. La vorto estis kreita por esti ekzamplo de kiel uzi afiksojn por kia ideo oni havas. Ili povas esti tre potenca. La traduko estas sufiĉe proksima al la unua traduko de Blindcat, ke mi akceptas tiun. A thing which is disgustingly in error and stays so for a while. An abomination. Well, as you saw, I was just as confused, but I THINK, based on other uses of multiple affixes, that "mal" only applies to the root. At this point, though, I can only hope that FredCapp shares with us his clearly more-advanced knowledge (and maybe gives us both lingots for trying so hard). Thank you, FredCapp. I hadn't grasped the thing about translating from end of word, that helps to make sense of it. Sometimes it is the little things. Ne dankinde. Kiel oni diri "I warned you about the stairs, bro!" en Esperanto? Oni diras: Mi avertis vin pri la ŝtuparo! La "bro" peco povas esti ulo, knaĉjo, frato, amiko, aŭ io alia vorto kiu vi sentas vin esti konvena. Hmm... very risky to say that. Very controversial. Could offend some of la junularo de Usono. We've only had elevators for like 90 years. Plu: "1743 A counterweighted personal lift was commissioned by Luis XV to be built linking his apartment in Versailles with that of his mistress, Madame de Chateauroux.."
Shouldn't "the young of America" be accepted, too? As far as I know, 'young', as a collective noun, is a synonym for "youth'. Esperanto is such a fun language, by the way! Sed verŝajne ili uzas rulŝtuparojn, ĉu ne? Ili glitas suben montetoj sur moruo fiŝo kapoj. Ĉu vi intencis "Moruaj fiŝkapoj"? Can Youngsters and Youth be used the same way? My first inclination is to say no, youngsters are children = infanoj. But, when I look it up, the answer ends up being yes. Moral: Never go with your gut on things, you might be wrong. Oh, well it didn't accept Youngsters, should I report it? Couldn't hurt. That might be a meaning that they haven't considered yet. Kiel oni dirus "Step by step" esperante? Unless, of course, one is discussing how to climb stairs; then it's probably ŝtupon post ŝtupo. Ha, dankon. Sed kial la akuzativo uzintas tie? Ŝajnas al mi, ke la unua paŝo(n) devus esti nominative kaj la dua lokative (se esperanto havus la lokativon, kompreneble). Ĉu vi bonvole povas klarigi ĉi tion? Mi ne certas. Mi kontrolis unu de miajn grandajn vortarojn kaj sub la kapvorto step estas ~ by step: Paŝon post paŝo. Do, mi legis aliajn (eble pli malgrandajn) vortarojn, kaj refoje trovis la saman informon. Laŭ mi, vi ĝustas pro la uzado de la akuzativo, sed eble estas io ke oni alia povas klarigi. Eble vi volis diri: "Mi esploris en unu el miaj grandaj vortaroj"
Eble vi volis diri: "vi ĝustas PRI la uzado de la akuzativo, sed eble estas io, KION IU alia povas klarigi". "PAŜO POST PAŜO" is the correct form. This is how Zamenhof, the creator of Esperanto, teaches us in one of his poems, La Vojo. Here are some verses: "L' espero, l'obstino kaj la pacienco – jen estas la signoj, per kies potenco ni paŝo post paŝo, post longa laboro, atingos la celon en gloro." Mi uzis kontroli ĉar tiu vorto = la anglan "check," kaj tio estas kion mi faris. Mi checked my dictionaries. Certe vi memoras, ke Zamenhof donis al ni specialajn regulojn pri poezio? Ĉu vi povas trovi alian uzadon de la subfrazo, sen la unua ~n, kiu ne estas en ia poemo, tion interesus al mi, sed, ĝis tiam, mi sekvos la informo de Montegue Butler kaj J.C.Wells. Ambaŭ kiu estis bonaj esperanto-instruistoj kaj kiu sciis (pli bone ol mi) la lingvon. To KubisFowler: Yes! "PAŜO POST PAŜO" is the correct form. Please see my reply to FredCapp here above. I really don't want to get into an argument that begins and ends in words, but I must point out that Zamenhof gave us some slightly different rules to apply to poetry. Leaving endings off, for purposes of rhyme or scansion are included in those rules. And even he was occasionally prone to typos. Now, if you could find me an example wherein Zamenhof said paŝo post paŝo in prose, I would find that more interesting, and probably lend it more weight. I would suggest first reading La Fundamento. Thank you for your endeavors and research, but do try to find more than one example before declaring someone to be totally out in left field, wrong, and a bad person besides. But you agree with "totally out in left field" and "wrong"? Time to meditate on your word choices. I didn´t say anything about "a bad person". Vi diris: "Certe vi memoras, ke Zamenhof donis al ni specialajn regulojn pri poezio? Ĉu vi povas trovi alian uzadon de la subfrazo, sen la unua ~n, kiu ne estas en ia poemo, tio interesus al mi, sed, ĝis tiam, mi sekvos la informon de Montegue Butler kaj J.C.Wells. Ambaŭ kiu estis bonaj esperanto-instruistoj kaj kiu sciis (pli bone ol mi) la lingvon." Nu, estus bonege por mia lernado, se vi povas doni pli detalojn pri la mencio al Montegue Butler kaj J.C.Wells. Ĉu ili rekomendas uzi la formon “paŝon post paŝo”? Vi diris: "before declaring someone to be totally out in left field, wrong, and a bad person besides. Nu, mi ne tiom bone komprenas la anglan (mi estas brazilano). Tial, mi respondas en Esperanto. Mi supozas, ke vi diris pli-malpli jenon: "antaŭ ol deklari ke iu estas tute erara, mi devas pli bone esplori la aferon". Ne estas facile trovi alian ekzemplon de Zamenhof rekomendanta la uzadon de "paŝo post paŝo". Tamen, mi pensas, ke unu ekzemplo estas sufiĉa, eĉ se enhavata en poemo. Z ne metis tie akuzativon pro poezi-faradaj kialoj (rimo aŭ metriko). Li neniam aprobis rimon de akuzativo kun nominativo. Li ne evitis akuzativon pro poeziaj kialoj, en tiu ĉi kazo aŭ kiam ajn. Vi diris: "I would suggest first reading La Fundamento". Kial vi sugestas al mi unue la legadon de la Fundamento? Ĉu en la Fundamento Z rekomendas “paŝon post paŝo”? Mi ankaŭ ne kredas ke temas tie ĉi pri preseraro Z-a. Ĉar, tiu akuzativo havas neniun pravigon en la E-gramatiko! Z eĉ deklaris ke "la uzado de Akuzativo en okazo de nebezono malbeligas pli multe nian lingvon ol ĝia neuzado en okazo de bezono". Fine, mi garantias al vi, ke ne temas pri nura privorta diskutado al nenio kondukanta. Efektive, mi deziras lerni pri la afero, por ke mi ne instruu erare al miaj gelernantoj. Mi dankas vin pro la pacienco, pro la kunlaboro, ĉial. I can't believe the youth of America don't use strap-ons. I put "group of young people" and was marked incorrect. I know that's a very literal translation, but I figured it would differentiate from "junuloj" which would be "young people". Why even bother adding the -ar? Is it a more abstract "group"? So not a particular group of young people, but young people as a whole? Kiu uzas sxtuparojn kiam estas pafiloj? It's politically correct to make fun of americans... excellent!!! Almenaŭ ni (nu, iom el ni) mokas ni mem (kiam estas sekura). Is this a little bit discriminating? As a part of the American youth, I can say that this is false! Or maybe I just don't group with people my age. I loved stairs ever since I was young and always wanted a two-story house just so I could play on the stairs, haha! *Updated* Esperanto-Eventoj en Usono: New York, North Carolina, California, Washington! "Ni uzas la vortaron por kontroli la difinon."